Your guests will be spellbound when magician David performs at your wedding reception in Warwick. Book David for your party in Warwick now and you are guaranteed to make it a great success. 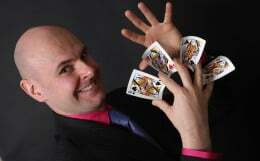 For corporate events in Warwick, professional magician David Fox is second to none. David Fox is available for wedding receptions, parties and corporate events around the historical town of Warwick and throughout Warwickshire. His unique brand of magic is sensational and David is perfect for any type of event - large or small. Warwick boasts a variety of famous venues and landmarks such as Warwick Castle, Warwick Racecourse and the Lord Leycester Hotel on Jury Street. If you are in the process or arranging a special function for family, friends or business, contact David Fox today for some unforgettable West Midlands Magic! 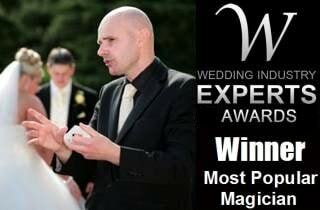 David was voted the 'Most Popular Wedding Magician' of 2014 and is a world class magician, entertainer and performer. Close-up magic, table magic, stage magic and elegant illusions are all aspects of David's extensive magical repertoire! Warwick Hospital is situated within the town and David's magic is perfect for all types of audiences from the young to the not-so-young. For wonderful entertainment that will leave everyone at your next function truly amazed around the River Avon, Warwick, Leamington Spa and Whitnash, contact the marvellous David Fox today.